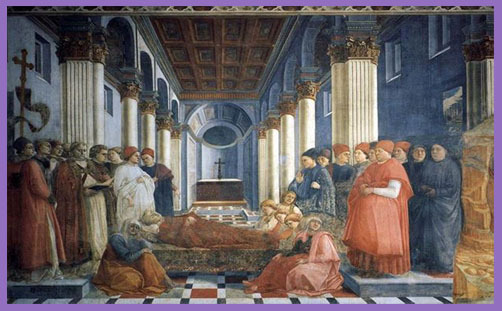 The funeral of St Stephen, by Filippo Lippi (1460). And he kneeled down, and cried with a loud voice, Lord, lay not this sin to their charge. And when he had said this, he fell asleep (Acts 6:9-7:60). Stephen was stoned to death in Jerusalem in AD36 – the first Christian martyr. He died defending the true doctrine of salvation from the indignant ‘certain of the synagogue’, who believed in their superior scholarship and learning that they held they keys to heaven and that Jesus was not the Messiah. When they couldn’t respond to Stephen’s reasoned argument, they became angry, as the theologically self-righteous so often do, and fabricated all manner of allegations against him – criminal, perjurer, blasphemer – exactly as many Christians endure today, for no other reason than that they profess Christ and him crucified. And for the defence of the gospel, Stephen was taken out of the city and stoned to death. His accusers murdered him, which they believed to be lawful execution for the greater glory of God. Today is his feast day. Today, across the Middle East, close to the area in which the angels announced God’s apocalypse, ISIS and others claim that this is the time of an apocalypse, an unveiling created of their own terrible ideas, one which is igniting a trail of fear, violence, hatred and determined oppression. Confident that these are the last days, using force and indescribable cruelty, they seem to welcome all opposition, certain that the warfare unleashed confirms that these are indeed the end times. They hate difference, whether it is Muslims who think differently, Yazidis or Christians, and because of them the Christians face elimination in the very region in which Christian faith began. This apocalypse is defined by themselves and heralded only by the angel of death. People of faith are being persecuted by people of another faith: Christians, Yazidis and Muslims who happen to belong to the wrong sect are being murdered by those fanatical dogmatists who have lost the theological argument and believe they have a divine mission to usher in the Last Days; the Apocalypse. In her Christmas Day message to the country and Commonwealth, the Queen spoke of these “moments of darkness”, and reminded us that “the Gospel of John contains a verse of great hope, often read at Christmas carol services: ‘The light shines in the darkness, and the darkness has not overcome it. '” As we remember the holiness and grace of St Stephen and his faith in the living God, let us pray today for all of those who are suffering intolerably and dying for their faith in Christ. There is providence in persecution. May they find peace and hope in their immanent apocalypse, for the evil that confronts them will never extinguish the light of Christ.